Here’s a bread and dough (works for pizza dough too) troubleshooting guide, culled from a variety of sources. 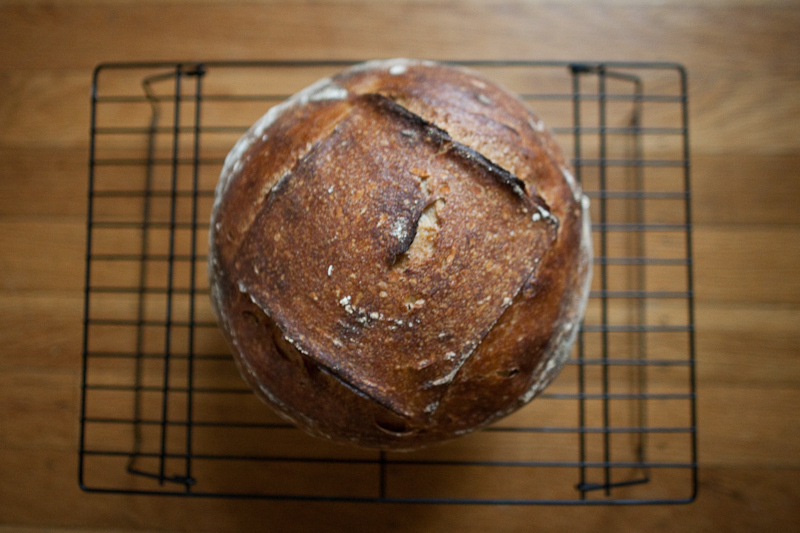 I hope to continually update this as I learn more in my quest to make great artisan bread. hydration ratio (aka water to flour ratio, or baker’s percentage) medium hydration Dough is easy to work with but not too sticky. 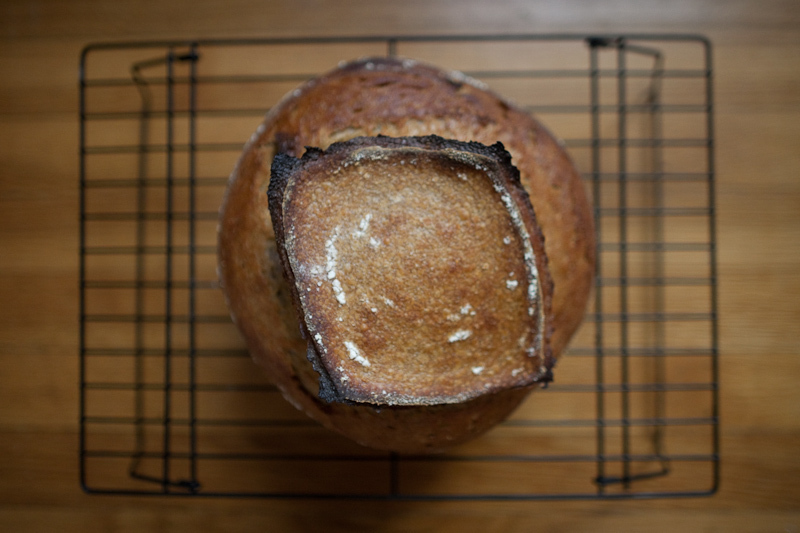 Note: Some flours, like rye flour, are just sticky by nature. rise just right Passes poke test. If the hole from the poke rebounds part of the way then proofing is just right. rise too much Fails poke test – (the hole does not rebound at all.) Dough collapses on itself. There’s so much air in the loaf that it cannot hold its weight. baking temperature low Lower baking temperatures generally make softer and thinner crusts. baking temperature medium Somewhere in between. baking temperature hot Higher temperatures generally make crustier loaves. This means darker and thicker crusts. Note: to really promote a thick, chewy crust, bake in a dutch oven. This traps steam near the loaf, which delays crust formation and allows it to get thicker. salt none or not enough The loaf may look good but it’ll taste like cardboard. It’s surprising how much salt enhances the flavor of the bread. If you realize you’ve forgotten before you bake, you may be able to make a salty paste and spread it onto the dough while you stretch and fold. salt too much Too much salt can inhibit yeast fermentation and may be too salty to taste. bake time too short Light crust, doughy and gummy interior. bake time just right Bread sounds hollow if you knock it on the bottom. Nicely browned crust. The internal temperature will be about 190-210F. 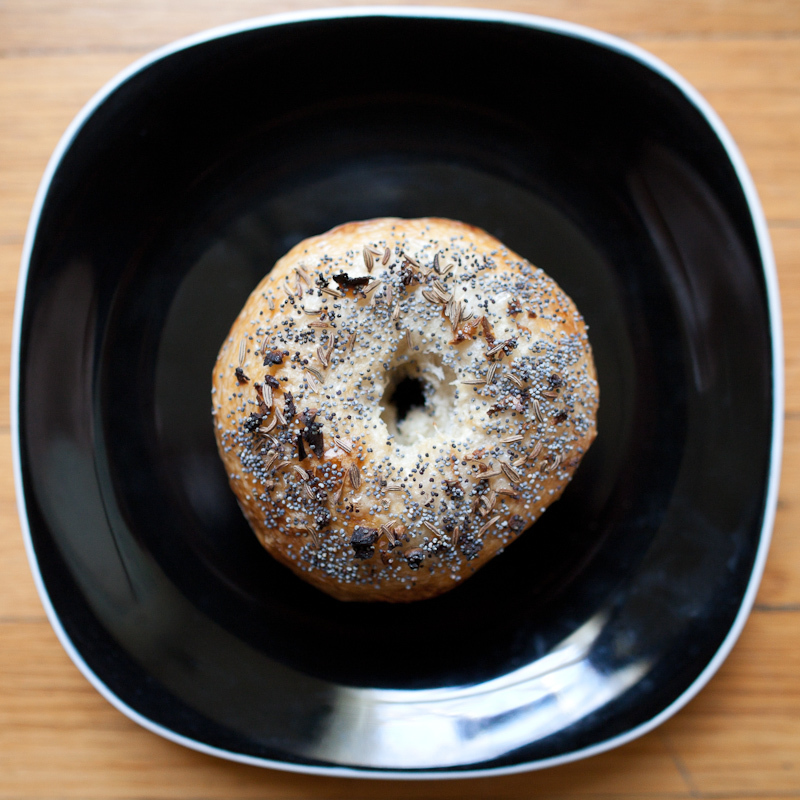 bake time too long Longer baking times mean a darker crust and a firmer and dryer crumb. Too much bake time = burny. gluten too little Low-gluten breads will not rise well. The bread won’t have the strength to expand when the yeast creates carbon dioxide. The dough won’t stretch well. gluten too much If there is too much gluten, the bread won’t be able to expand because the dough will be too tight. The bread will be really chewy and rubbery. 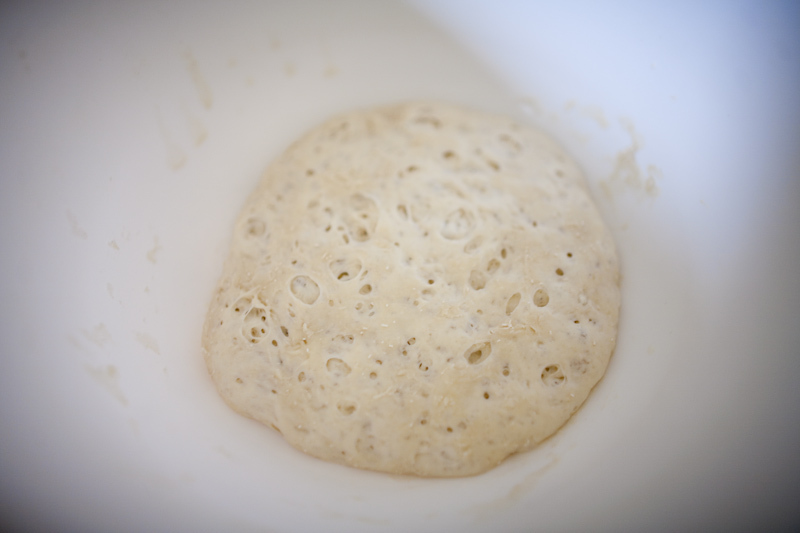 yeast too little Dough rises really really slowly or not at all. Your loaf will be dense. In extreme cases, it’ll feel like a brick or a stone. And the inside will be gross and barely edible. With artisan sourdough breads, this can happen if your starter has died or if you haven’t adequately refreshed it. Have questions? Share them in the comments below. does anyone know if old flour loses it’s gluten content so it won’t rise as well? my flour smelled fine, but it was over 2 years old! Organic unbleached white flour! It could be this reason when I let it rise, and then I went to touch it, shrink back to original size, and wouldn’t rise again. used new flour today. tried window pane test and it was correct. left dough in covered bowl to rise, first hour it rose a little and i poke tested it was fine, second hour was too high and poke tested and it shrunk back! and the dough is really slimy and slippery too! So you’re having the same problem with new flour that you did with old flour? How much volume is it gaining when it rises? Does it double in size? How much water and flour are you using? Slippery and slimy might be okay depending on the type of bread you are trying to make. You may find that a lower hydration ratio will be easier to work with though. yes I had the same problem last time with new flour. It rose 50% and held volume and then after the second hour it was double original size, but when I touched it, shrunk back to original size. I used 1 cup water and 3 eggs to make the dough with 4.5 cups flour. I think the yeast content overfermented, today I am going to just let it rise for 1 hour and not 2 because the second hour ruined it last time. It still rose 50% again in the oven when baking last time. But it was impossible to braid and make challah like the directions said after the first rise. Yeah, I think the first loaf you were referring to overfermented since it shrank back down when you touched it. How did your 2nd one turn out? 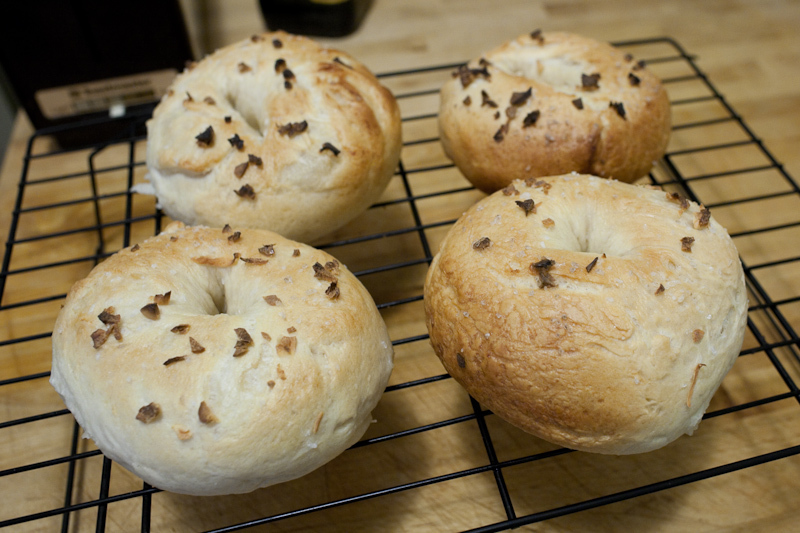 I haven’t tried baking breads with eggs, such as challah, but perhaps you could try using more flour next time. According to a few recipes I found online (such as http://www.thefreshloaf.com/recipes/honeywholewheatchallah) you could probably have an extra 1 to 1.5 cups of flour to get your hydration down a bit. This should also slow the yeast’s activity. Are you using all-purpose flour? It’s probably okay to do so, but just curious. Last weeks loaf rose double in the oven, after shrinking beforehand like the week before. I don’t know how I would get 2 more cups of flour in there. I thought adding too much flour, it wouldn’t consolidate into a ball of dough. I always add just enough water to make sure I can make that ball. Maybe the recipe since it called for 1/4 cup sugar, that sugar was used to feed the yeast so it didn’t eat too much gluten? Not sure if yeast picks and chooses what to eat while it’s rising. 2 percent of 1000 is 20, no 2. So for 1000 grams of flour, the rule of thumb for salt should be 20 grams of salt. Oops, fixed that. Thank you! I often bake chiabatta , the taste, shape and crust is very nice, but the bigger holes tends to be more to the top of the bread. That does not bother me so much, but sometimes a biiiigggg hole form just below the crust. All the way through the bread. Resulting in a sorry slice!